Are you looking for a great alternative to fundraising chocolate bars? We have the perfect option. 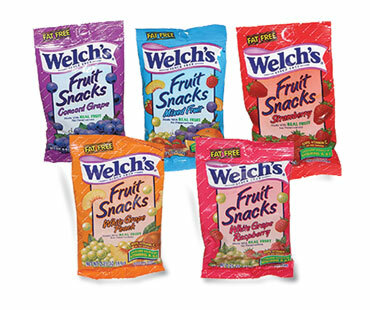 Check out our Welch's fruit snack fundraiser. Healthier Option - The snacks are 100% Vitamin C, an excellent source of Vitamins A and E, FAT FREE, made with real fruit and has no preservatives. FREE SHIPPING - Shipping is absolutely free. Can Be Sold Year Round - Welch's Fruit Snacks, though, can be shipped at any time during the year, expanding your selling window to the entire calendar year. Unlike candy bars they will not melt so can be sold even during the hot summer months. Determine how many cases to purchase. Most groups purchase a case for every 1 or 2 people selling. Place your order. Fruit Snacks, though, need to be paid for when you place your order. We accept major credit cards, checks, money orders and can even give credit terms to public schools issuing valid purchase orders. You can order your Welch’s Fruit Snacks by calling us toll free or you can purchase your fruit snacks online in our secure store.